Born in Beijing in 1957, Julian Yu surprised his non-musical family by starting to compose music at the age of 12. In 1973 he left school early to study composition at the Central Conservatory of Music in Beijing, and later joined the teaching staff there. In 1980 he was sent to Japan to study at the Tokyo College of Music under Joji Yuasa and Schin-Ichiro Ikebe. After his return in 1982 he resumed teaching and wrote a lot of music for film, television and radio as a “ghost composer” under other people’s names. In 1985 he migrated to Australia. In 1988, he was selected for a Composition Fellowship at Tanglewood, and was awarded the Koussevitzky Tanglewood Composition Prize for that year. Since then, Yu has won numerous prizes and much recognition for his composition, including an Australia Council Composer Fellowship and grants from the Australia Council and other organisations. In 1991 and 1994, an international jury unanimously selected his work for the 1st and 2nd triennial Paul Lowin Orchestral Prizes (Australia’s richest award for composition). For his achievements, he was awarded a Doctor of Music (D.Mus) by the University of Melbourne. He currently teaches Composition and holds an honorary Fellowship. The influence of East and West are combined with ease in this track. 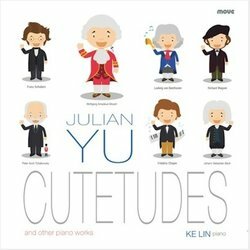 This unique version of Promenade from Pictures at an Exhibitionuses Chinese-style embellishments and imitations of Chinese zither sounds - all from one piano! A delightful walk by the The Great Gate!